I’ve realized recently that the coyote reactions to dogs which I have written about involved mostly a dominant female coyote — a mother of pups. I need to distinguish between various individual coyote reactions to dogs which deviate from those of a dominant female. The dominant female with pups will always have the severest reactions to dogs — defensive reactions and controlling reactions. Most coyotes have milder reactions to dogs. Several distinctions might be useful. 1) Almost all coyotes will “flee” from humans. Coyotes do not want to tangle with humans. Humans are larger and more intelligent than coyotes, so invariably when the two approach in the same vicinity, the coyote will run off. I have never seen a coyote not run off when a person walks toward it. Approaching a coyote defiantly and noisily will make it leave faster. Most coyotes will also flee from dogs that run after them. 2) I have seen a coyote approach a dog on a path non-antagonistically if the dog has been previously seen by the coyote as fairly benign: the coyote may be curious. If a coyote approaches a leashed dog, please know that it is the dog, and not the human, which is attracting the coyote, and the approach may be antagonistically motivated. It could be that a dominant female coyote feels a particular dog is a threat — it appears almost always to be a dog she has seen before and evaluated. The dog may be one who pulls at the leash, or looks at the coyote defiantly or maybe it has chased the coyote in the past. The dog owner may be seen only as a minor deterrence to the coyote’s approaching. 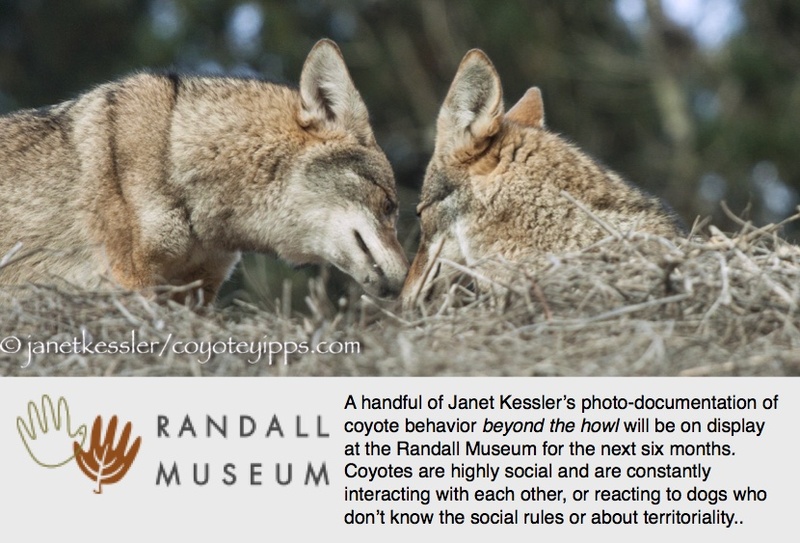 The coyote will approach with a dominance display, described below. A human can get the coyote to leave by facing the coyote and flailing his arms and making loud, sharp noises, such as clapping or shaking a can with bolts in it. HOWEVER, whether a coyote is in the distance or approaching or already close by, it is always best to leash and WALK away from it: utter and complete avoidance is always the safest policy. 3) “Defensive” means that an animal will protect itself when it is attacked or feels threatened. A coyote might begin by fleeing from a dog which goes after it, and when unable to get away, it goes into a defensive mode. Or, it may just stand its ground without fleeing: in this case it is just standing up for itself and is not going to be pushed around. Most animals will try to defend themselves at some point when others intrude upon them, and we all expect this. I’ve seen a gopher bite a coyote back, even though there was no hope. He was fighting for his life, but it was a defensive fight, not an aggressive one. The coyote’s defensive behavior towards dogs involves a dominance display, then a charge-and-retreat sequence, and ultimately a nipping at the haunches of the dog to get it to leave, much as a cattle dog does. 4) A “Dominance display” can be distinguished from aggression. It is more about “bluff” and “show” and is used to impart a message. It lets dogs know — dogs who are perceived as a threat to a coyote, such as active dogs or dogs who have chased — that they are not welcomed or liked by the coyote. It looks very much like the defensive behavior, which also might begin as a display, except it is initiated by a coyote as a message to the dog, usually because of previous negative encounters, be they overt chases, or simply messages imparted by body language and eye contact. We humans are simply not in tune to a lot of canine communication behavior. Bluffing displays are used to dissuade and move other animals in hopes of averting a fight that might actually cause injury. We’ve all seen dominant dogs: they want it to be known that they think of themselves as “top-dog” by displaying their bigness and ferocity. They do this by standing up straight with their head high, raising their hackles, maybe growling, not wagging their tail or wagging it stiffly, looking down on the other animal, etc. 5) Coyotes in our parks are seldom outright aggressive towards dogs. We normally think of an “aggressive” animal as one who will actually attack without provocation — it just doesn’t like the other guy, and may not like most other guys. There is less of a message than an attack, though the attack itself leaves a message. Coyotes are not known to be aggressive. However, it is the exceptions you want to be prepared for, even though statistically this is so rare that these are seen as anomalies. We have learned that the few aggressive encounters between coyotes and humans have almost always been preceded by humans feeding them. I have never seen an aggressive coyote of this sort. For safety’s sake, please, never, ever feed wildlife. The closest looking thing to an aggressive coyote that I have seen is one defending itself from a dog — see the defensive photo above. Please see posting of December 7th: “Dog Reactions to Seeing a Coyote”, November 4th: “ANOTHER reaction to dogs”, November 17th: “More reactions to dogs”, and December 1st: “Significance of a Seemingly Unprovoked challenge”. Also, please see the entry on “Coyote Safety” of 11/3. Blatant Visual Message to Newcomer Dog of 2/9/10. “A short back-and-forth chase: coyote interaction with a large dog” of 2/4/10.